There are two DUKES OF HAMBURG just to let you know, both are a mix up from each-other, the DUKES OF HAMBURG from Bielefeld, Germany and the DUKES OF HAMBURG from San Francisco, USA. The story so far: In the early 90s, Thilo Pieper went to San Francisco and formed the American Dukes with members of THE MUMMIES, THE ASTRONAUTS, THE PHANTOM SURFERS and bassist Shannon Smith. The American Dukes toured up and down the West Coast and did two very successful European tours, then moved back to Germany and continued The Dukes in Bielfeld while the American Dukes were still doing shows. Both bands play ‘60s beat and garage with wild abandon and are inspired by THE LORDS, RAINBOWS, CASEY JONES, and many of the ‘60s German Beat favorites as well as early PRETTY THINGS and other groups from the pre-psychedelic 1960s rock ‘n’ roll scene. “Liverpool Beat” is the first album by the German DUKES OF HAMBURG on Dionysus Records, following the release of three American DUKES OF HAMBURG LPs on the label in the ‘90s. 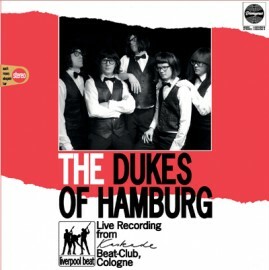 THE DUKES OF HAMBURG are Germany’s Number One Beat Group at the moment!